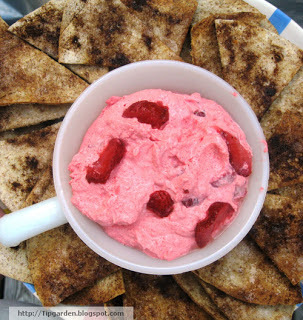 A wonderfully light, fruity and creamy dip that can be made with raspberries or strawberries with baked cinnamon-sugar tortilla chips is a perfect sweet treat for your next gathering such as a bridal shower, book club or any time! 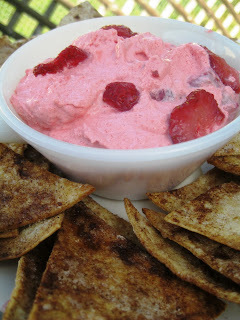 Jan's tip: I lightened up my recipe by using fat free cream cheese, sugar free jello, sugar free whip cream and made the tortilla chips with Splenda and whole wheat tortillas. I can promise you, no one will ever know I lightened it up! Jan's tip: I used 1/2 cup. diced frozen strawberries. I folded the strawberries in frozen and as they thawed, they thinned the dip for me just right. If I had used fresh, I would for sure have thinned it with milk just a bit to make it easier to dip the chips. Butter or spray the tortillas with non stick spray. Spinkle with sugar or splenda and then with cinnamon. Cut into 8 pieces (like a pie). bake at 400 degrees for 7-8 minutes until the chips start to turn brown. Use the chips to eat the delicious dip.